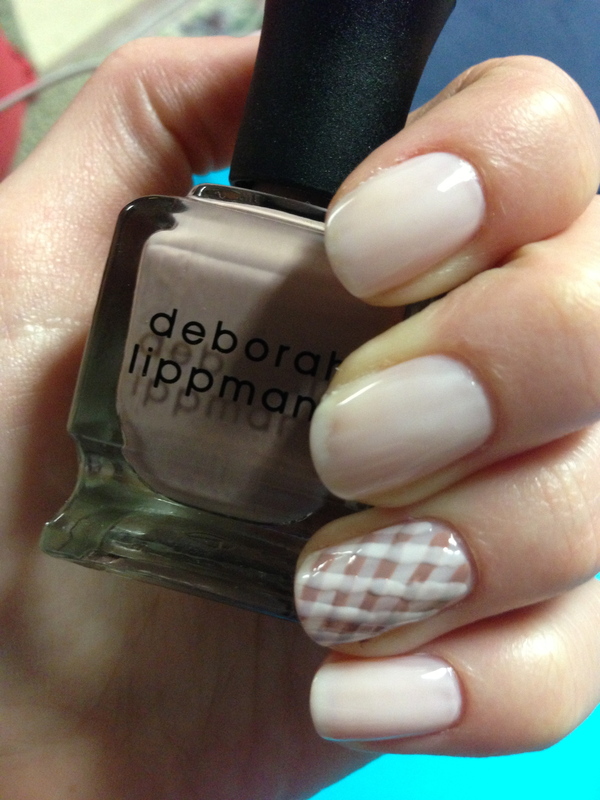 Today’s Manicure Monday is a gorgeous tone-on-tone gingham print. Bright, bold colors definitely stand out, but it’s the intricacy of the pattern that makes this look shine. I actually aimed for a much different look – ultra skinny diagonal lines – but after trying to create it, my ultra skinny lines came out pretty … hefty. Sometimes beauty comes out of mistakes because I really ended up loving the way these turned out. I’m not going to lie – it’s a pretty hard look to achieve on yourself. It was hard for me to accidentally achieve, so it might be easier to get if you’re setting out to get the look. Brave enough to try it yourself? Read on. As always, start your manicure with clean nails and a coat of your favorite base coat. Mine? You guessed it! Seche Natural. 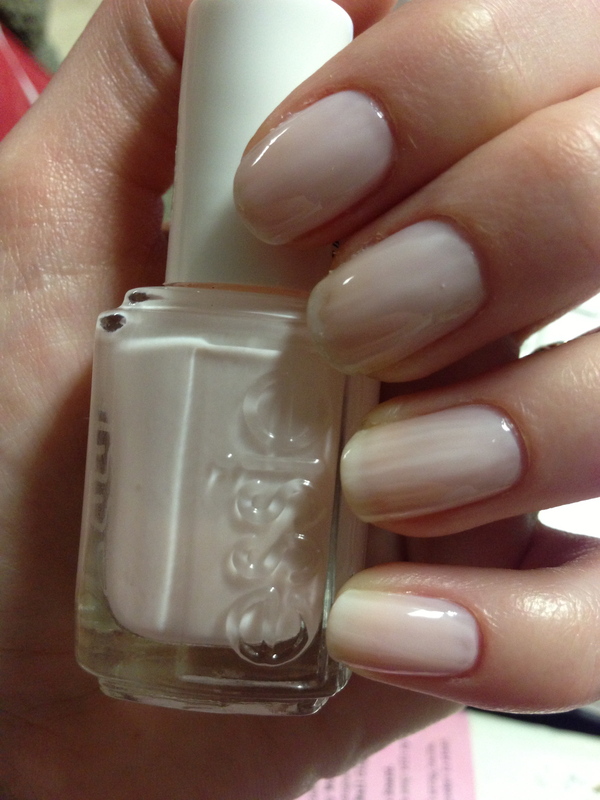 Continue with two coats of your base color – I used Essie’s Ballet Slippers. Ballet Slippers is a sheer baby pink – so sheer that I’d typically use three coats for this color, but since you’re going over your base with more polish, you don’t need more than two. I really think that muted, neutral tones look best with this manicure. Bold colors could make it look like a plaid shirt or tablecloth – or it might look awesome. But I like the neutral. To create the stripes, find a polish in a similar color family, but darker shade. I used Deborah Lippmann’s Modern Love. Take a skinny paint brush – you can find really tiny watercolor brushes for cheap at a dollar store – and dip it in your polish. Carefully draw skinny lines on a diagonal across your nail, leaving equal amounts of space between each line. Don’t fret if your lines aren’t totally straight or perfect. Mine definitely weren’t. Drawing a straight line is harder than you think. Once you’ve drawn diagonal lines down the length of your nail, clean your paintbrush (I just fill up the nail polish remover cap with remover, swirl it around, and dry it off) or grab a new one. Dip the brush into your original base color (Essie’s Ballet Slippers) and draw diagonals down the length of your nail in the opposite direction, so they criss-cross over the darker lines you created. Allow the polish to dry partially, if not completely, before finishing with your favorite topcoat (Seche Vite, for me!). I really wanted to recreate the pattern on each nail, but after doing it on one nail, I realized I needed to keep it to an accent. If you have the patience to recreate the look on each of your nails, go for it! If you try this look yourself, make sure to tweet it to us @Collaboreight! love this look; only I don’t have the patience. Love all your posts. Thank you! This look definitely requires patience. We’ll be sure to put up some easier looks – be sure to check back!